I didn't even notice. Thanks for pointing that out. That's because of the wide-screen mode on this. The game is originally 4:3, and they're turning on true widescreen for 16:9. But what that does is widen the screen, and show things that were never meant to be shown. 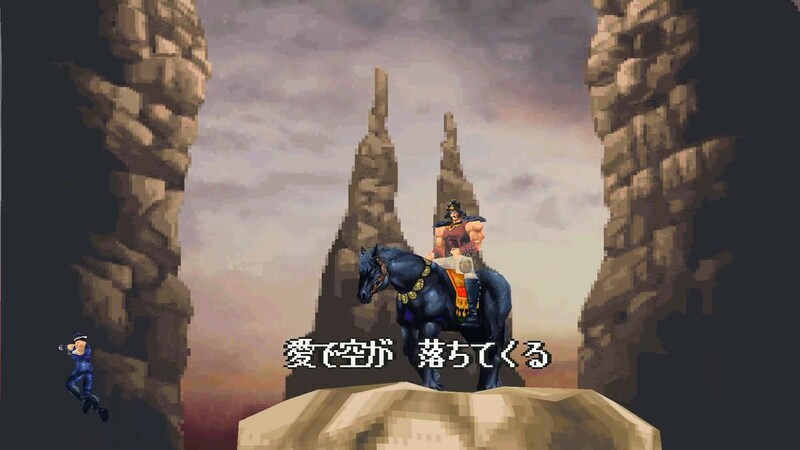 In this case, it looks like the game pre-loads Kenshiro to use him in the next scene. So yes, that happens in the original, but you'd never notice it because it'd be offscreen in 4:3 mode. If I had to take a guess, this entire sequence is likely constructed in a relatively small room, and then the camera turns to different sides of the room while it loads the next scene off screen.